Food trucks are common in Anchorage and in other, bigger communities across Alaska, but for the most part, they are still rare in smaller places. 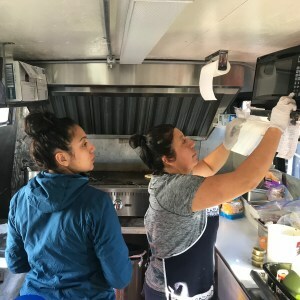 One food truck in Kodiak is creating quite a stir, serving up the national food of El Salvador, along with some other dishes. Inside the bright blue food truck parked in the driveway of their simple one story home, the Martinez family spends most Friday nights chopping and prepping enormous amounts of cabbage, carrots and cilantro. “We are from El Salvador. We sell pupusas, tamales, but at the same time we sell Mexican food. We got tacos, burritos, quesadillas. We got two kinds of tamales — Salvadorian and Mexican tamales,” Moises Martinez said. Moises explains that Mexican tamales are wrapped in a corn leaf while Salvadorian ones are packaged in a banana leaf. After conditions in his home country of El Salvador became dangerous, Moises moved with his wife and children to California. He heard that there was money to be made working at a fish processing plant on Kodiak Island, so he traveled here. He only planned to work one season, but he liked it in Kodiak. So in the early ’90s, he brought his family, and they’ve been here ever since. Moises says he thinks there are roughly 100 Salvadorians here. Many, like Moises, came to Kodiak fleeing war, found good jobs, became involved in the community and stayed. Moises has a full-time job as a dock foreman at one of the fish processors, but for years his family has been selling pupusas along with Mexican cuisine from small stands, off and on around town. In his spare time, he says he recently converted and customized the family’s food truck himself. Moises says it took him about a year to transform the minibus into a commercial kitchen. “I like how busy it is,” 21-year-old Jency Martinez, Moises’ daughter, said. Before Jency went off for training to become a dental hygienist in Washington State, she worked four summers at the family’s food business to save up money for school. And Jency is busy. She has three jobs. Jency’s mother, Maria Portillo, is the cook. She prepares family recipes and Jency takes orders. But before Maria prepares the food, she has to do a lot of chopping. “This is salad for the pupusas and we need to make everything today,” Maria said. Portillo starts on Friday evening after she closes her in-home daycare and preps all the food until late into the evening. “Cabbage, carrot, cilantro and pepper and … a lot of vegetables,” Maria said. Maria gets up around 6 a.m. to finish and to make tamales. She’s ready to open the food truck by 11 a.m. on Saturday. Over the years, all of her kids have helped out. That they are proud to share the foods from their homeland, makes her happy, Maria says. “All the kids they make tamale[s], they make pupusa[s]. I have my oldest son. He’s the [engineer]… and when they have a party they make it and they say, ‘This is my food from my mama country, yeah,’” Maria said. The truck is nestled in between a coffee drive-through and a large construction project along Kodiak’s main drag. As soon as they open the window, people start lining up, brought in by the aroma of of lime, cilantro and frying meat. Inside the truck, Jency and Maria do a well-choreographed dance as chicken and steak sizzle on the grill. Jency takes orders and makes change while Maria puts food in to-go boxes. 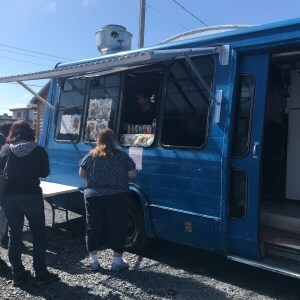 Standing outside the food truck on a recent Saturday, customer Erin Briggs said, “It’s the quintessential food truck.” Briggs says that she has lived in Kodiak just a couple of years and she says she was excited to see Maria’s appear. Moises Martinez says that earnings from the business, in its various forms, have helped the family achieve several financial goals, but it isn’t just about how many tacos they sell. He says they brought their business back with the new food truck because they love sharing their food and a little bit of their culture with the community. Maria’s Place, the food truck, is open Saturdays through the summer, 11 a.m. to 7 p.m.